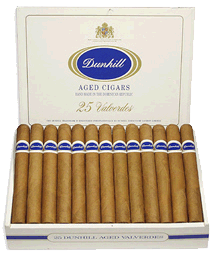 Dunhill Aged Dominican | Chicago's Pipe, Cigar & Tobacco Store | Iwan Ries & Co.
Every Dunhill Aged Dominican cigar is impeccably handmade from a special selection of Piloto Cubano and Olor tobaccos grown in the Dominican Republic's fertile Cibao Valley. After being wrapped in a Dominican binder, the cigars are encased in only the finest quality USA-Connecticut shade-grown leaves. The final stage of blending includes aging for one year in cedar-lined rooms to produce one of the most mellow, well-rounded, and finest cigars in its class.